Inventory We are a resale marketplace, not a box office or venue. Ticket prices may exceed face value. This site is not owned by Red Rocks . The Red Rocks Amphitheatre opened in 1906 in Morrison, Colorado as one of the most spectacular open-air venues in the world. 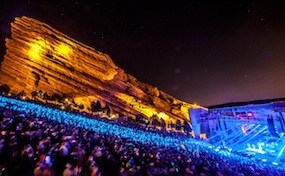 The Red Rocks Amphitheatre has won the Pollstar award for best small outdoor venue 11 times. The Red Rocks Amphitheatre box office is located on 17598 West Alameda Parkway less than 30 minutes west of Denver. Some of the biggest acts in history have played at this historic venue including The Beatles, U2, Grateful Dead, Jimi Hendrix, Fleetwood Mac, Neil Young, and more. Red Rocks Amphitheatre tickets give you the opportunity not only to see an amazing show but also be a part of history. Many performers have used this venue for DVDs and live recordings. The Red Rocks Amphitheatre has a limited seating capacity of 9,450 so you can assure yourself of a great seat. 2017 was as big as ever featuring Chris Stapleton, Sam Hunt, Miranda Lambert, Tom Petty and the Heart Breakers, and many more. AmphitheatreMorrison.com is an independently owned and operated company that specializes in providing low prices a wide array of inventory online for all secondary market events. Tickets may be below or above face value and prices can change hourly. We are not affiliated with any official supplier, box office, or website. To order tickets to all Red Rocks Amphitheatre events simply click on the performance of interest or pick up the phone and call our operators at anytime.